Hi there! I hope you've enjoyed your visit on Cliffie Stone's website with all its photos and informative captions which are a part of country music's history. Cliffie's writing style was one-on-one, as if he was having a personal conversation with his reader. Many of his book readers wrote and said how much they loved his writing style! This is why Cliffie wanted his website to be personable too. Cliffie's above books are still available (click on Books section). The new 1017 discount price is now $7.50 per book plus shipping/handling of $5.00. 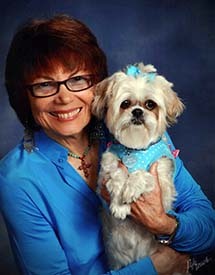 If you order two books, we'll include Cliffie's CD, "Dancing With A Memory" as a gift! On the West Coast, Cliffie was one of the Founders of the Academy of Country Music’ (ACM) and served on its Board. The ACM has its annual TV awards show in April (Las Vegas, NV); and its annual ACM's Honor Awards Show (awards include the "Cliffie Stone Pioneer Award") which is held at the historic Ryman Auditorium in Nashville in the fall. To see pictures of many of the Cliffie Stone Pioneer Awards recipients, click on photos. To see the recipient list from 1968 onward, click here. You can also go to the ACM's website and click on their Awards section. In the South, Cliffie served on the Country Music Association's Board of Directors. He became lifelong friends with Ms. Jo Walker Meador (CMA's Executive Director from 1962-1991). In 1989, Cliffie was inducted into the Country Music Hall of Fame. The CMA has its annual TV awards show in Nashville in October; they also have their prestigious annual Country Music Hall of Fame Awards Show, which is held at the Country Foundation Museum in Nashville later in the year. 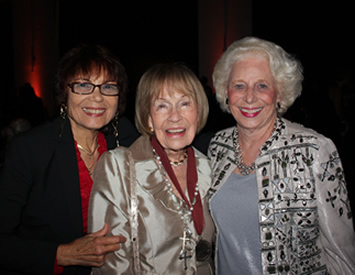 (Right photo taken at the CMA Hall of Fame Show in 2014; Joan Stone, Jo Walker Meador, and Patsy Bradley [daughter of CMA Hall of Fame producer, Owen Bradley]). I hope that you consider joining one or both of the above country music organizations! It's so much fun to be a part of the Country Music scene!